With so many flooring choices available to the homeowner today, stone floors have always been a popular choice. There are many different types of stone floors and most of them are all hard surfaces. Stone floors are rich and believe it or not give a room a warm old world appearance which makes the so popular with residential homeowners. Cleaning Stone floors for many homeowners seems to be a tough task but in reality they are relatively easy to clean on a routine or daily basis. The goal of this article is to provide are readers with a simple easy steps to routinely clean their stone floors. 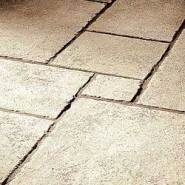 These are simple procedures and steps when cleaning stone floors because what we are recommending are cleaning products and tools that almost every home would have laying around the house. Some simple precautions need to be adhered to such as the following. Some residential homeowners prefer to protect their stone floors with sealing them with a top coating such a sealer or floor finish (wax) and some do not. Either way the following cleaning steps when cleaning stone floors are for both sealed and unsealed stone floors. Dry Cleaning: Dust mop floor using an untreated dust mop with a Swiffer or Bona dust mop system or sweep with a broom to remove most of the surface dust. We highly recommend using a flat mop dust mop system using microfiber pads to dry clean the stone floor. If the floor is a rough surface, then broom sweeping would be required. Remove gum and other debris adhered to the floor with a Blunt Plastic Scraper.